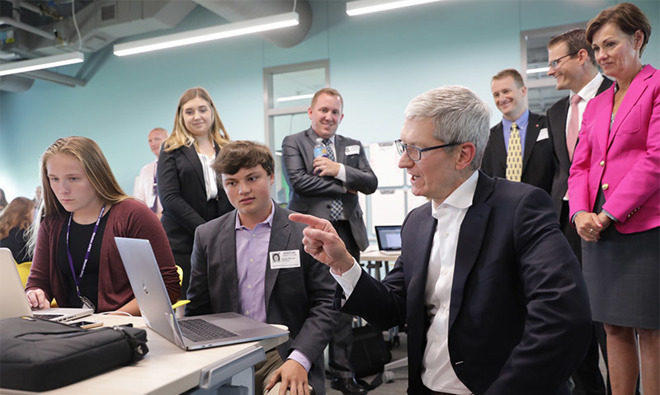 Apple CEO Tim Cook is scheduled to sit down and discuss CEO leadership with Fortune executive editor Adam Lashinsky on Monday, a live-streamed event that will kick off the publication's "CEO Initiative" series. Announced late in the day, Cook's appearance will be live streamed via the magazine's website at 6:05 p.m. Pacific. What, exactly, Cook and Lashinsky will discuss onstage tonight is unknown, but the event covers the topic of "companies doing well by doing good." Ostensibly, Cook intends to laud Apple's extracurriculars, which include a wide range of social and environmental initiatives. Human rights concerns are another topic of interest for Cook, who has received multiple awards for his efforts toward equality, both in and out of the workplace. Under his tenure, Apple has become a leading supporter of LGBT issues and non-discrimination policy. More recently, Apple's aspirational social programs have conflicted with its business operations. Last year, Apple came under fire for removing certain VPN apps from the iOS App Store in China to remain in line with that country's laws. Some decried the move as a step toward denying free speech. Earlier this year, Apple once again found itself in the crosshairs of among human rights activists when it moved iCloud account keys to Chinese servers. Again, Apple was obeying Chinese law, but critics said the migration could be dangerous for users branded as political dissidents, whose communications and personal information might soon be open to surveillance.